Right to Dignity & Respect: Should everyone in Texas have the right to a life of dignity and respect, free from discrimination and harassment anywhere, including businesses and public facilities, no matter how they identify, the color of their skin, who they love, socioeconomic status, or from where they come? Right to a Fair Criminal Justice System: Should everyone in Texas have the right to a fair criminal justice system that treats people equally and puts an end to the mass incarceration of young people of color for minor offenses? The house district club concept can be applied to any election district division - Senate District, Congressional District, Commissioner District, Court of Appeals District, etc. A total of 15 seats out of the State Senate chamber's 31 seats are up for election in 2018, including Collin County's Districts 8 and 30 incumbent Republicans. Texas state senators serve 2-4-4 terms, where senators serve one two-year term and two four-year terms each decade. Republicans have maintained control of the Senate since 1996. Since 2002, the GOP has kept their majority steady at around a 7-seat advantage. As of December 2016, the Republican Party holds 20 senate seats to 11 seats for Democrats. District 30 of the Texas Senate includes all of Archer, Baylor, Clay, Cooke, Grayson, Jack, Montague, Palo Pinto, Parker, Shackelford, Stephens, Throckmorton, Wichita, Wilbarger, Wise and Young counties, and portions of Collin and Denton counties. 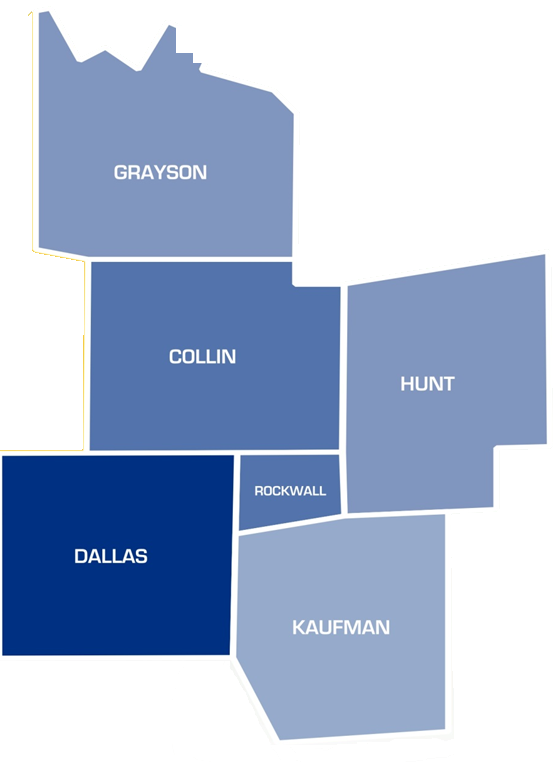 District 8 includes the southwest quadrant of Collin Co. and parts of northern Dallas Co.
Precinct Chairs are party officials elected by voters of their respective precinct in Democratic Primary Elections scheduled on the first Tuesday of March in even numbered years. A county precinct is the smallest political subdivision in Texas. Texas counties are divided into individual precincts based on voting eligable population census. Precincts can have as few as a few hundred registered voters to a maximum of 5,000 registered voters. Precinct chairs file to have their name placed on primary ballots, just like every other person seeking election to public office. When only one person within a precinct files for a ballot position, their name is not placed on the ballot and they are considered automatically elected to hold that public office. The term of office is two years, beginning on the 20th day following the Primary runoff election. The county executive committee (CEC) may fill precinct chair vacancies between elections by majority vote appointment. Get the Voter List for your Precinct. Visit everyone in the Precinct who is on the list (or assigned blocks if only a Block Captain) and make yourself known. Ascertain for which presidential and or gubernatorial candidate people last voted. If they are registered but never voted, ask two or three questions about their positions or views on issues such as jobs, public school funding, property taxes, Social Security, Medicare, prescription drug cost, school vouchers, conservative judges, fiscal attitude, etc. Build a database of district voters who will likely vote for Democrats. Start to meet all those NOT on the voter list to determine who will vote for Democrats. Add these to your database with notes. 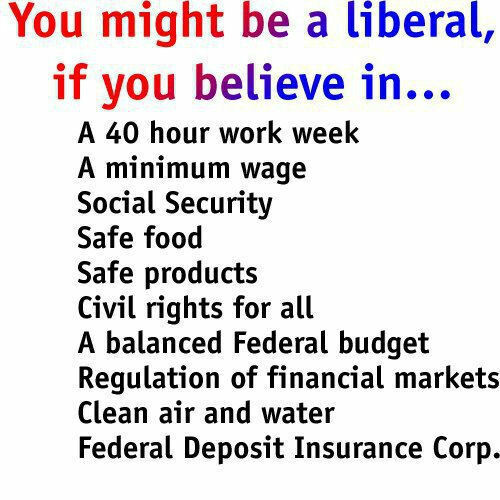 Try to define the Independents as to the issues. 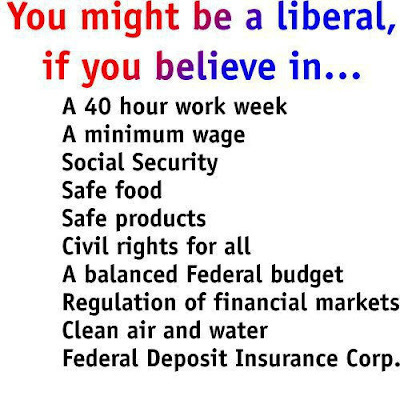 They might be amenable to voting for Democrats in the right circumstances. Stay in touch with all those who you have identified as with you on the crucial issues. You will want to add them the Facebook group. Appoint Block Captains of your own if you are already Precinct Chairman. Be prepared to walk the Precinct with the candidates toward election time. Attend all district group meetings. As the Party Primary season arrives (every two years) be prepared to work your contact lists to get out the vote. Learn the protocol for the party, county or senatorial district convention. Remember the SD/County Convention leads to State and National Conventions. Voting members of the Democratic National Committee and state executive committee - who set the party's agenda at the state and national levels - are elected by state convention delegates, who are themselves elected at SD/County conventions. Precinct Chairs also sit on the County Executive Committee, which conducts the local business of the Party. The duties and responsibilities of Precinct Chairs provide fundamental services to party effectiveness. County Party Chairpersons must also file to have their name placed on primary ballots. Their names always appear on ballots, even when unopposed. All partisan voters in the county vote for county Chair candidates. Texas Courts of Appeal are distributed in fourteen districts around the state of Texas. Like the Texas Supreme Court and Court of Criminal Appeals, Justices of the Texas Courts of Appeals are elected to six-year terms by general election. The Fifth District Court of Appeals includes one Chief Justice and twelve Justices. The 5th District Court of Appeals is one of our region's most important courts with jurisdiction over criminal, family and civil appeals cases for Dallas, Collin, Rockwall, Kaufman, Grayson and Hunt counties. The unusually high number of 8 of the 5th district's 13 seats, including the Chief Justice's seat, are up for election in 2018. 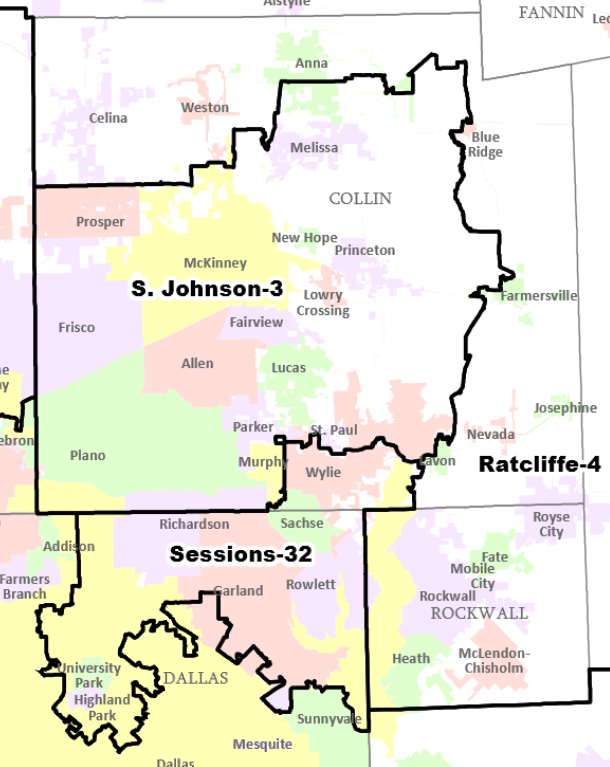 Texas' 36 Congressional Districts have some peculiar designs. An analysis of them shows just how gerrymandered the state has become. (See an interactive map of the districts; read an analysis on the map here). 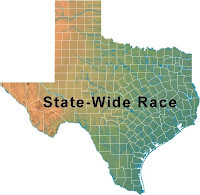 Each Texas district has an estimated population of 698,488 people. However through a strategy called “packing-and-cracking,” redistricting packs Democratic voters into a few districts and dilutes the rest, leaving the GOP with a comfortable majority in the remaining areas. Sam Johnson's 3rd congressional district falls completely within Collin County. Texas' 4th Congressional District covers counties of the northeastern portion of the state, including Bowie, Camp, Cass, Delta, Fannin, Franklin, Grayson, Hopkins, Hunt, Lamar, Marion, Morris, Rains, Red River, Rockwall, and Titus counties, along with areas of Collin and Upshur counties. Texas' 32nd Congressional District includes portions of Dallas and Collin counties. The office of Criminal District Attorney is statutorily created by the legislature. A Criminal District Attorney is legally bound to handle all felony and misdemeanor criminal matters within the county and all civil matters related to representation of the county, county officials, as well as all associated matters. The District Clerk performs the duties assigned by the Texas Constitution as registrar, recorder, and custodian of all court pleadings, instruments, and papers that are part of any legal cause of action in the District Courts of Texas counties. In performance of those duties, District Clerks indexes and secures all court records, collects filing fees, manages court registry funds, and handles funds held in litigation and money awarded to minors. The District Clerk also coordinates the jury panel selection process and may process passport applications. The County Judge is both presiding officer of the commissioners court (Tex. Const. Art. V, Sec. 18) and judge of the constitutional county court (Tex. Const. Art. V, Sec. 15). As such, the judge is often thought of as the chief executive officer of the county. The duties of the county judge vary depending on the population of the county. In most rural counties, the judge has broad judicial responsibilities and is often the principal source of information and assistance. The judge's duties as presiding officer of the commissioners court includes carefully abiding by statutes requiring that meetings of governmental bodies be open to the public. Additional specific statutory charges are enumerated in the following: elections, finance, bonds and sureties, court operations, mental health, special districts, and general administration. Your Collin County Commissioner's Court Precinct Number can be found on your Voter's Registration Certificate within the box titled "Com." The Legislature created statutory County Courts at Law in more populous counties to aid the constitutionally created single county court of each county in its judicial functions. The Texas Constitution provides for one county court in each of the 254 counties of the state. In the more populous counties, where the legislature has created county courts at law, the county judge may devote his or her full attention to the administration of county government as the presiding member of the County Commissioner's Court. The legal jurisdiction of the statutory county-level trial courts varies considerably and is established by the statute which creates the particular court. The jurisdiction of statutorily-created county courts at law may be concurrent with the jurisdiction of the single constitutional county courts and district courts in the county. The civil jurisdiction of most county courts at law varies but is usually more than that of the justice of the peace courts and less than that of the district courts. County courts have original jurisdiction over all criminal cases involving Class A and Class B misdemeanors, which are the more serious minor offenses. County courts usually have appellate jurisdiction in cases appealed from justice of the peace and municipal courts. In more heavily populated counties, like Collin County, the Legislature created specialized Probate Courts to hear probate matters exclusively. Statutory probate courts are located in 10 of the state's 15 largest metropolitan areas and have original and exclusive jurisdiction over their counties' probate matters, guardianship cases, and mental health commitments. The County Clerk is the clerk for county courts at law, including probate courts, and the commissioners court. The clerk is also the recorder for the county. All instruments filed for record are done so in the county clerk's office. The clerk carries out issues marriage licenses, maintains vital statistics, and may administer elections for the county where a separate office of county elections has not been created by the county commissioners. County Clerk are custodians of records for the Commissioners Court, Constitutional County Court and Statutory County Courts. The clerk also acts as a recorder and custodian of important public records, including all bonds, deeds, marriage, birth and death certificates, assumed names and livestock brands, ensuring records are maintained in a secure, archival manner. First, the length of the term of office was constitutionally extended from two to four years beginning with the election of 1974. Second, lieutenant governors have served ever more numerous terms since the 1890s. The increased longevity in office can significantly increase the informal influence and legislative expertise of lieutenant governors, and enables them to consolidate their control over the committees. The Christmas Mountains, in the heart of the Big Bend region of southwest Texas, were donated to the State of Texas in 1991. The foundation that gave the land to Texas stipulated that the Christmas Mountains were to remain public. The land should have been transferred to the National Park Service (NPS) and been made part of Big Bend National Park years ago. However, Republican Land Commissioners have blocked making the Christmas Mountain area a part of the Big Bend National Park.